A good distortion stompbox gives you at least a few distinct distortion sounds. The TC Electronic Dark Matter is a great stompbox distortion. Far from any one-trick pony, the Dark Matter gives you an enormous range of gritty and rich distortion tones, covering the spread from mild fuzz to the roar and sag of a Plexi pushed to the breaking point. 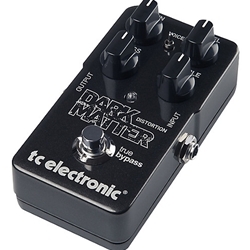 What sets the Dark Matter apart from other distortion pedals is the way TC approaches tone shaping and EQ.